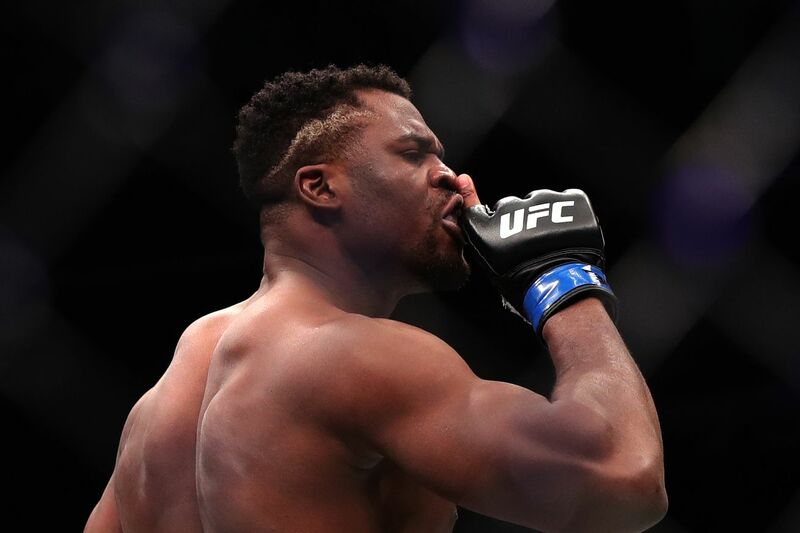 Francis Ngannou has a true rags-to-riches story, perhaps the most unlikely in the entire Ultimate Fighting Championship. He grew up hauling sand in the mines of his village at age 12 in Cameroon, left home at 22, eventually made his way to France, and found a gym and coach while still homeless wandering the streets of Paris. His coach, also from Cameroon, let him sleep in the gym, seeing potential in the soft-spoken young giant, and the rest is history. What he recently explained in an interview on Sirius XM makes the story even wilder: he left his village without saying a word to anyone, simply because he couldn’t tell them where he was going! It wasn’t exciting because I didn’t know where I was going! I didn’t have a map. I couldn’t even tell them goodbye, because when you say, ‘okay, I’m leaving’, the first question is ‘where are you going?’ and I couldn’t tell anybody where I am going, so I couldn’t say goodbye to nobody. I just go visit my family. I stayed with my mom in my village for like three weeks. I was, like, looking at them like sometime like, this might be the last time that I’m seeing them. Because, you know, some people go there and some never come back, they died. Basically I knew that if I tell them, no one will accept that. I always have crazy dream, they always saw me as very ambitious, like over high, and I was like, I’m not gonna tell them, they know that people go there and someone die..
Interviewers: What did you tell them? After the flabbergasted hosts clarified that he really, truly left without saying a word, Ngannou said that his family didn’t know where he was for nearly three weeks. Ngannou most recently knocked out Cain Velasquez in the main event of the first UFC event on big ESPN, putting him on a two-fight win streak. His victory before that, a lightning finish of Curtis Blaydes, snapped a two-fight losing streak, in which he was outwrestled by Stipe Miocic and then dropped a lackluster decision to Derrick Lewis. His combination of size, athleticism, power, and timing make him a formidable opponent for anyone at heavyweight, and a win over, say, Junior dos Santos, could earn him another shot at the title. What is going on with PFL fighter Will Brooks these days? Just life. The much-anticipated Featherweight title fight between division king, Max Holloway, and Brian Ortega — which was set to go down at UFC 226 this past summer — was delayed after “Blessed” was forced out of the fight a few days due to health issues. As a result, the 145-pound title fight was re-booked to go down this Saturday night (Dec. 8, 2018) at UFC 231 in Toronto, Ontario, Canada. And despite the fact Holloway is confident his issues are behind him, Ortega still has a small fear in him that the fight can be taken from him at any moment once again. “Small part. Because we know that usually when Max starts cutting weight, that’s where that issue always comes up, you know? And we are worried a little bit, but, I mean I’m doing my part,” said Ortega on a recent appearance on Ariel Helwani’s MMA Show. It’s because of that fear that “T-City” says he hasn’t been too emotionally attached with the idea of fighting Holloway, saying he is simply preparing his mind and body to fight somebody at UFC 231. “Yeah. Emotionally haven’t really invested myself in it anymore, especially since the last one. I’ve kind of just detached myself and just have to be ready for whatever. The way I put is that I am just going to fight for a title no matter who it is now. I am just going to get ready,” he added. Indeed, Ultimate Fighting Championship (UFC) pegged Renato Moicano as a backup should anything forbid either Max or Brian from competing Saturday night, which puts Ortega’s mind somewhat at peace. Holloway has proven to be the undisputed king of the 145-pound weight class over the past few years, defeating Jose Aldo to win the title and then defending it against “Junior” a few months later. In fact, “Blessed” hasn’t tasted defeat since 2014, winning an impressive 12 bouts in a row against a who’s who of competition. Now, he’ll look to keep it going by handing Ortega his first-ever loss in mixed martial arts (MMA). A tough task to say the least. MMAmania.com will deliver LIVE round-by-round, blow-by-blow coverage of the entire UFC 231 fight card on fight night (click here), starting with the Fight Pass “Prelims” matches online, which are scheduled to begin at 6 p.m. ET, then the remaining undercard balance on FOX Sports 1 at 8 p.m. ET, before the PPV main card start time at 10 p.m. ET. To see who else is fighting at UFC 231: ‘Holloway vs Ortega’ click here. The relationship between Al Iaquinta and the Ultimate Fighting Championship seems to get worse by the day and now it might be close to breaking point after the New York native pulled out of his most recent fight with Justin Gaethje at UFC Lincoln. Colby Covington is at it again, suggesting that the Ultimate Fighting Championship’s next pay-per-view event, UFC 228, which features a title bout between welterweight champion Tyrone Woodley and Darren Till, won’t generate much interest without him. Tony Ferguson is at least half million dollars richer after his Ultimate Fighting Championship lightweight title win. On the other hand, he actually had to fight to get it. 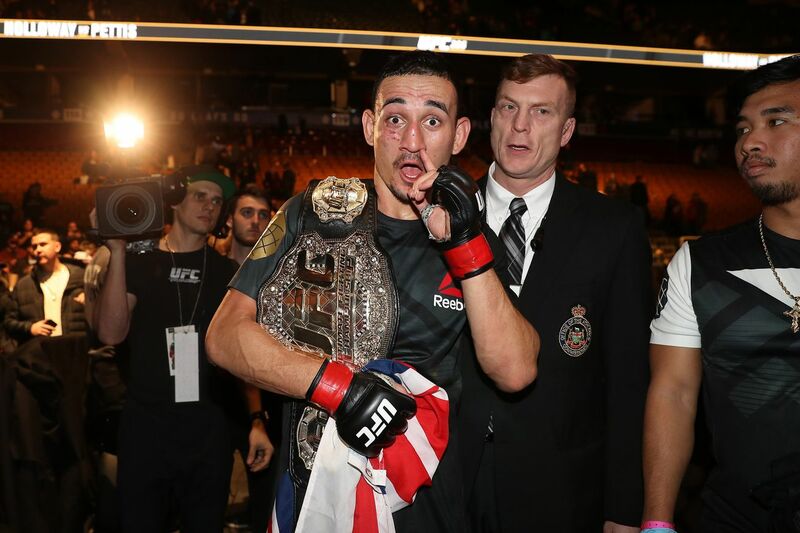 Ultimate Fighting Championship (UFC) featherweight champion Max Holloway, at some point over the past four years, forgot how to lose, racking up 11 straight wins, including last June’s finish over Jose Aldo, which netted the promotion’s 145-pound strap. When will “Blessed” make his first title defense? That remains to be seen, since the 25-year-old Hawaiian is a king without a castle, as the “Junior” showdown was the last fight on his current UFC contract. As you might expect, being champion with that kind of winning streak demands a pretty penny. From his conversation with told KHON2. Holloway (18-3) is expected to meet with UFC officials over the next few days. “Blessed” has a legitimate claim to being the most exciting fighter in his (or any) division, grabbing eight violent finishes during that 11-fight streak, which includes technical knockout victories over Aldo and Anthony Pettis. Time to see what that’s worth to UFC. On Wednesday, Nate Diaz went on The MMA Hour where he discussed all manner of things, including turning down an interim title fight with Tony Ferguson and his take on all of the Conor McGregor vs. Floyd Mayweather hullaballoo. That same day, UFC President Dana White responded that he didn’t know if either Nate or his brother Nick would ever fight again and that he didn’t think they really wanted to fight. This juxtaposition has become an increasingly common one for Dana White. A year ago, Georges St-Pierre made clear his intentions to come back to MMA but White insisted St-Pierre didn’t actually want to return because the former welterweight champion insisted on restructuring his contract with the UFC, one made before the inception of the Reebok deal and the removal of sponsorship money. Similarly here, because Diaz insists on his next fight being “all the way right, financially,” White insists that Diaz doesn’t actually want to fight because, according to White, he’s already getting the best offer that’s viable from the UFC. Speaking with Yahoo Sports, White said that for Diaz to be worth the kind of money he’s asking for, he would need to accept and win an interim title fight against Tony Ferguson. “Whatever his deal is, he’s got a pretty good deal,” White said. “I mean, listen, at the end of the day, what is Diaz worth without Conor McGregor? I don’t know. The kid isn’t in a position for pay-per-view or any of that type of [stuff]. But this could put him in a position. If he fought Tony Ferguson, it would be for the interim title. With the UFC currently desperate for any stars capable of driving a pay-per-view – so much so that they offered St-Pierre a middleweight title bout in lieu of a host of more qualified contenders – White’s insistence that Diaz isn’t in a position to make pay-per-view money is a strange one. Diaz, already a known and well-liked fighter beforehand, became one of the biggest stars in the UFC after defeating McGregor last year. Still, White insists this is an issue of Diaz not wanting to fight and, though he admits both Nate and Nick are popular, he also says he won’t try and force them to fight. “It doesn’t frustrate me at all [that they’re inactive] because I’ve learned that you can’t make people fight, man. It’s the same thing when people ask me, ‘What if this guy retires,’ or ‘What if that guy retires?’ This is a business that, your head has to be in this game. You have to want to become a world champion. You have to want to fight. You have to go through everything it takes to get into the cage. It doesn’t frustrate me at all. We’ll keep offering the Diaz brothers fights until one of them says yes or they never fight again. Violence. The UFC has signed WSOF champion Justin Gaethje. Wolf tix. Nate Diaz says wolf tickets are making a return with McGregor vs. Mayweather. Joanna knows. Joanna Jedrzejczyk says she knows she can knock out Jessica Andrade after training with her. Welch. Battlefield FC has yet to pay multiple fighters from their last event. Dana’s latest on Floyd, says it’s not close. Morning Wood Show. Junior dos Santos interview and Woodley talking about acting. Fight Society. Frankie Edgar interview and PVZ discussion. Bushido Talk. Chuck Liddell and Anderson Silva discussion. Most exciting fighter in MMA. Literally. Seriously, FOTN bonuses are spoken for anytime Gaethje is on the card. That Weidman, so hot right now. Please, no. Anderson doesn’t need that. How could anyone not love JDS? Definitely never thought I’d see that. Dana White will go to his grave before starting to come off paying fighters anywhere near their actual value. Best compliment any fighter in MMA can receive is Dana saying that they don’t actually want to fight. Another off weekend for MMA but another weekend of solid, top-shelf boxing. If that’s your bag, enjoy Canelo-Chavez Jr. tomorrow. If not, hang in there, 211 is right around the corner and it’s the best card of the year. Have a good weekend y’all. If you find something you’d like to see in the Morning Report, just hit me up on Twitter @JedKMeshew and let me know about it. Also follow MMAFighting on Instagram and add us on Snapchat at MMA-Fighting because we post dope things and you should enjoy it. Former UFC women’s bantamweight champion Holly Holm will be fighting for a title again at UFC 208 in Brooklyn, and the set-up for that is somewhat serendipitous. Holm, who has lost a pair of fights in a row, was selected to fight in the inaugural women’s featherweight title fight on Feb. 11 against Germaine de Randamie. The decision to book Holm against de Randamie was met with some criticism given that the weight class has been ruled for a decade by Cristiane “Cyborg” Justino, who last fought Lina Lansberg at a 140-pound catchweight bout in September. Yet Holm was willing to fight in the new weight class, and she was available — which, according to the UFC, “Cyborg” was not. And Holm’s longtime coach Mike Winkeljohn said during an interview on The MMA Hour that that was precisely the case. According to Winkeljohn, Holm was willing to fight Cyborg at a catchweight before the title fight with de Randamie materialized for a card in need. “That’s exactly what happened, is Cyborg can’t make the normal 135-pound division and so, because she gets to play by special rules, we said okay look, we’ll fight you at 138,” he said on Monday. “That was our first offer. I’m not going to lie, I probably would have went to 139 with it. But it wouldn’t have made sense for Holly, where the weight was at, to offer to fight her at a higher weight. Of course not, why would I do that? One thing that Winkeljohn made clear was that if the UFC had presented Holm a chance at the 145-pound title against Justino, they would have accepted the offer just the same. In fact, he said he was taken aback initially that “Cyborg” wasn’t part of the equation. “Very surprised that they would offer without Cyborg involved,” he said. “It makes sense now that Cyborg…they needed to put some fights together, I think, and Holly is a big draw. She can sell, and they needed some big fights, and they needed them now. They can’t wait down the road until Cyborg gets her weight down or whatever the case is. That’s just the way it played out. Winkeljohn has worked with the 35-year-old Holm in Albuquerque going back to the beginning of her boxing days. He has seen her win titles in the ring, and in the Octagon, and knows that there are big paydays coming to Holm in 2017. Should she defeat de Randamie, she would be come the first woman fighter in the UFC to have held belts in two different weight classes. And a victory would set up numerous big fights, depending on which way the UFC might want to go — especially with UFC 207 featuring Ronda Rousey’s return against current bantamweight champion Amanda Nunes. Holm defeated Rousey at UFC 193 in November 2015, and since that time the rematch has loomed through Rousey’s hiatus from fighting in 2016. Still, heading into UFC 208 the elephant in the room will be handing out a featherweight title to anybody other than “Cyborg,” who was the last Strikeforce champion in that division, as well as the reigning Invicta FC champion. Asked his thoughts on why the UFC would opt to have a featherweight title fight without Justino, Winkeljohn said it was largely circumstantial. “I don’t know, it’s not for me to know why,” he said. “I think ‘Cyborg’ needed some more time to get down to weight, but I guess people are saying she’s out there power lifting, so she has no worry about it. She’s going to do what she wants. That’s her weight division, 145. Like I said, the smart move is Holly was at 135, and fighting her at 135 would have been the smart move, and 136 would have been a smart move. But that’s where we’re at. As to whether he liked the idea of Holm fighting long-term at 145 pounds, Winkeljohn said he goes back and forth on that. Khabib Nurmagomedov is the latest UFC contender to feel slighted by the perceived special treatment of Conor McGregor, and he is willing to take drastic measures to express his discontent.